...the overall colony size has been reduced, but not to levels targeted in a "Caspian Tern Plan" approved in 2006 by the Corps. A plan to disperse the largest share of Caspian terns from the species' largest West Coast nesting colony has thus far fallen short so the U.S. Army Corps of Engineers, Portland District is offering for public comment a strategy that would further reduce desirable habitat at the lower Columbia River's East Sand Island. The Corps proposes this spring to reduce nesting acreage at the East Sand Island Caspian tern colony in the Columbia River Estuary from 1.58 acres to 1 acre in order to lessen the number of nesting pairs on the island. By reducing the number of nesting pairs, the project aims to reduce tern predation in the long-term on juvenile salmonids listed under the Endangered Species Act. All juvenile salmon and steelhead streaming down from the Columbia river basin, including Willamette and Snake tributary systems, must pass by East Sand on their way to the Pacific Ocean. With a gradual reduction in nesting habitat -- achieved largely be revegetating portions of the island to make it unappealing ot the birds -- the overall colony size has been reduced, but not to levels targeted in a "Caspian Tern Plan" approved in 2006 by the Corps. Those goals fell short because many of the birds decided to nest more closely together at the island rather than moving elsewhere. Unexpectedly high nesting density resulted. "The Caspian Tern Plan targeted approximately 3,125 to 4,375 nesting pairs on ESI with reduction of nesting habitat to between one and one-half to two acres, resulting in a predicted 1 percent or greater increase in population growth rates for four Columbia River Basin steelhead ESUs," according to the draft environmental assessment released last week by the Corps. "Steelhead was used in model predictions because they are more susceptible to Caspian tern predation than other salmonid ESUs in the Columbia River Basin. "The amount of nesting habitat available to Caspian terns on ESI has been reduced since 2006 from about 6.5 acres to the current 1.58 acres established in 2012. The reduction expected a result of 3,125 to 4,375 nesting pairs as identified," in the Corps' record of decision for the plan (for one and one-half to two acres). "Despite incremental reductions in the amount of nesting habitat, numbers of nesting pairs and amount of predation on juvenile salmonids have remained fairly constant. In 2013, at 1.58 acres of nesting habitat on ESI, the number of nesting pairs was near 7,111 and predation on juvenile salmonids was near 4.7 million (Roby et. al. 2013). "In 2014, at 1.55 acres of nesting habitat on ESI the number of nesting pairs was estimated at 6,269 breeding pairs and predation on juvenile salmonids was near 4.5 million (Roby et. al. 2014). This is the smallest colony size recorded at ESI since the initiation of reductions in tern nesting habitat on the island in 2008. This represents a 41 percent decline in Caspian tern colony size on ESI from its peak in 2008 (ca. 10,670 breeding pairs). "Neither the FCRPS BiOp objectives for juvenile salmon survival nor the purpose and need of the Caspian Tern Plan have been met. This indicated that additional acres of alternative habitat were needed to be able to reduce the managed habitat area at ESI to 1.0 acres," the draft EA says. In response to the need for additional acres, in February 2015, the Corps completed five new islands amounting to 2.3 acres in South San Francisco Bay on the Don Edwards National Wildlife Refuge (DENWR), the draft EA says. "This new habitat provides the Corps with the necessary acres needed to propose a final reduction of habitat at ESI to 1.0 acres as described in the Caspian Tern Plan, and thus the basis for action in this Draft EA." The Caspian Tern Plan called for the creation of alternative nesting islands elsewhere to make up for habitat reductions at East Sand. From 2008 to 2010, the Corps constructed eight islands located east of the Cascade Range in southern and southeast Oregon, Fern Ridge Reservoir in the Willamette Valley in Oregon, and northern California in the Klamath Basin. 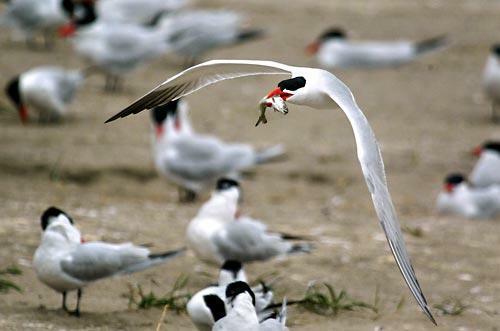 All, including Malheur Reservoir in east-central Oregon, have since entertained Caspian terns in recent years at various levels, depending in many cases on environmental conditions. Newly created habitat is intended to be at least double of that lost because of East Sand reductions. The Corps last year proposed reducing the East Sand nesting area to one acre, but dropped the idea when it became apparent that tern resettlement was unlikely given lingering drought conditions at the newly created inland nesting sites. The new Don Edwards sites provide what should be a good option for the birds. "The forage fish availability in the south bay is tremendous," said the Corps' Paul Schmidt. The proposed action would address actions called for in NOAA Fisheries' 2008 / 2010 biological opinion for the Federal Columbia River Power System. The BiOp requires implementation of the Caspian Tern Management Plan and evaluation of the effectiveness of the plan. The proposed action is considered adaptive management toward meeting the goals of the opinion and plan, specifically with respect to number of nesting pairs of Caspian terns at the East Sand Island colony. The ESA BiOp judges whether federal operation of dams in the Columbia River system jeopardize the survival of protected salmon and steelhead species, and recommends actions that need to be taken to avoid jeopardy. The public comment notice expires March 17. Caspian terns have a broad distribution in the world, and in the United States. The "Western Metapopulation" nests various locations from Alaska to southern California. They first nested on East Sand Island in 1984 following deposition by the Corps of fresh dredged material at the eastern tip of the island in 1983. By 1985, vegetation covered the island site making it unsuitable for nesting, and by 1986 the tern colony had shifted to Rice Island, a dredged material disposal site 16 miles upriver. In 1999 and 2000, the Corps socially attracted the terns, using decoys and playing pre-recorded callbacks, from Rice Island, back to East Sand, which is owned and managed by the Corps. This relocation was done to decrease the numbers of juvenile salmon and steelhead consumed by the terns. East Sand is much closer to the Pacific than Rice Island and as a result offers nesting terns a wider variety of prey such as marine fishes.